A few years I go I started a January tradition of looking at projects that I had started sometime in the past, but have yet to finish. Last year I did not do this. I had stitched so little over the previous couple of years that I thought it was a waste of time, and just a rehash of the same projects that are in the same state. In 2015 I finally got my needle out again, and have been stitching. So between Christmas and New Year I decided to resurrect this tradition. Then disaster struck! When I went to make my first post on New Year’s Day, I tried updating some plugins first and somehow totally crashed both my websites for more than 24 hours! So the first 3 days of my WIPs and UFOs will be in this one post. I will then try to post every day for the rest of the month. My first project was a long term UFO. This year I decided to transfer it into my sewing basket and have been taking it with me to my stitching days at The Embroiderer’s Guild of Victoria. 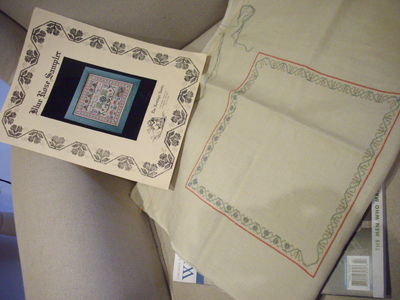 It is the Blue Rose Sampler by The Nostalgic Needle. I am still working on the borders, but I am so much closer to finishing them. This is a project that I have started in the last 18 months. I went to a Stitching Soiree hosted by Mrs Martin of Mrs Martin’s Quilt Shop and Lisa of Fig ‘n’ Berry. I got so far, then I stopped. I really do need to continue with this project. The main project of Twas the Night Before Christmas was started on the first stitching day I had taken since the end of October 2012. The day had started out horribly. And when I finally arrived at the venue in Bayswater, I sat at my table, head down, needle in hand, stitching, just stitching. It took a while, but just by focusing on my stitching, I was able to start pulling myself out of the massive funk I was in. 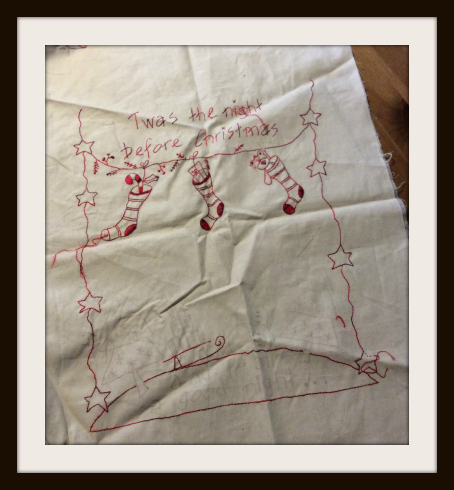 I have stitched on this project since, but as you can see, 2 Christmases have passed and it still is not finished! 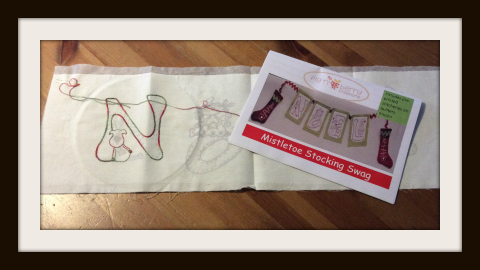 Another Stitching Soiree, another Fig ‘n’ Berry project! The Mistletoe Stocking Swag. I attended another Stitching Soiree, this time with a friend of mine from Mrs Martin’s Quiltshop. I had so much fun working on this! I really do need to get back to it. So there you are, the first 3 days of my 31 Days of WIPs and UFOs. Come back tomorrow for the next instalment.